"I think it blinds people to the rest of my career. I don't consider it one of the top five accomplishments in my running career, but the public has a fascination with the four minute mile. There are dozens of African kids who have run that fast by the time they were 18 years old, so it isn't really that big of a deal worldwide. What I did in high school is just that - what I did in high school. Only a handful of runners have ranked number one in the world at 1,500 meters which I believe that is a much more significant accomplishment." - Marty Liquori answering the question: What does it mean to be one of only five US high schoolers to go sub-4 in the mile? Talking about the attitude which brough him success in running and life, he says, "My personality is such that I can't just do something a few times a year for fun - I have to achieve a certain level of competence." J. Wariner out for the season! is anyone else worried that Solinsky hasn't run a single hard race this year?? 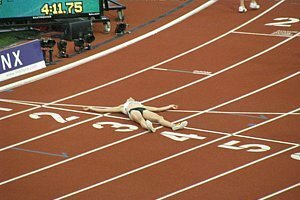 *Wariner's Injury Will Hurt The US 4 X 4's Chances Of Continuing Its Winning Streak Wariner was on the teams that won in 2005, 2007 & 2009. Ireland's 100m Runner Trying To Join Oscar Pistorius As The 2nd Disabled Athletes Competing At World Champs Jason Smyth is a vision-impaired sprinter who has ran 10.22, which gets him the "B" standard, but is still short of the 10.18 "A" standard. Bulgaria's Ivet Lalova Could Be A Threat In The Daegu 100 As She's The First European To Go Under 11 Seconds In 6 Years Ran 10.96 at the Balkan Championships last month, ranks 7th in the world this year. 21 Czech Athletes Named For Daegu Can you name any top Czech male distance runners? Apparently neither can they. That's okay, they'll always have Emil Zátopek. More Kenyan Athletes Move Into World Championships Camp As Coach Admits They Don't Do Much Of Anything "The shape they are in is very encouraging and it has made our work easier since what we shall be left to do is to maintain their form and sharpen their tactic." 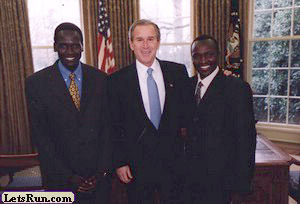 Meet The Unknown 10,000 Kenyan Champ, Peter Cheruiyot, Who Fulfilled His New Year's Resolution By Making Kenyan Team He talks about using team tactics to defeat the Ethiopians and sweep the medals at Worlds. Galen Rupp may have a thing to say about that. South Africa's Top 10,000 And Half Marathon Woman, Irvette van Blerk, Is Struck By Car In Training This came hit just months after their top male 1,500 runner, Juan van Deventer, was hurt much more severely. Now the weird thing is she was hit after she visited van Deventer earlier that day. Cornell Alumni Magazine Profiles Morgan Uceny Uceny on Worlds: "I want to be the last one standing at the end of it all." To all the skeptics who doubt her classic progression, we'd like to point out the piece includes a photo of her from her sophomore year when she was way less fit-looking and way less fast (2:06). Final Day Recap Of UK Trials: Mo Farah, Jenny Meadows Win, Perri Shakes-Drayton Completes 400, 400m Hurdles Double Mo Farah ran over a minute slower than last time out, running 14:00 as Jenny Meadows got her first UK title and 21-year-old James Shane ran 3:36 to win the UK title by an incredible 3 seconds on the last lap (he was a 3:42 guy a year ago). Mo Farah: "I'm definitely going to concentrate on one event and put all my eggs in one basket and that is the 10k." Journalists are getting carried away with the quote but he also said, "I'm looking at definitely doing the 10,000m at the World Championships and then I will see how I'm feeling to the 5k." Jessica Ennis To Skip Diamond League London Event Next Week To Compete Somewhere Else Whenever they say it's not about the money, it's about the money. When Wejo was in Scotland in January, Ennis was on billboards throughout the city. Dwain Chambers Wins 100m Euros silver medallist Mark Lewis-Francis was DQed for false start and will hope for discretionary spot. Ethiopia's Former World XC Champ Werknesh Kidane Wins 10k In 31:08 NZ's Kim Smith dropped out mid-race. It's OK In Our Minds If He Dopes: 97-Year-Old Wins 8 Golds At USATF Masters Champs He only went 3 feet in the long jump but ran 30 seconds for the 100. Elvan Abeylegesse Gives Birth To A Baby Girl Giving birth isn't different, but translating an article from Turkish is. JumpRunThrow.com Interviews Charles Jock Asked why he goes out in that crazy 49-second first lap, he says, "I'm driven to do this because I don't want to have regrets if I lose, I want to know that I ran to the best of my ability and they were just better than me that day. There's probably nothing worse than losing in a slow race." Recap Of Day 1: Mark Lewis-Francis Posts Fastest 100m Semi-Final Qualifying Time With 10.30 Mostly just trials on first day. UK uses similar qualifying system as Kenya, as the top 2 finishers get an automatic bid to World Champs and the 3rd spot is "discretionary." France Trials: Christophe Lemaître Lowers His National 100 Record To 9.92 This is with a just-barely-legal 2m/s tailwind. The Telegraph Says Mo Farah Is Not Getting Attention He Deserves Compared To Top UK Athletes In Other Sports Well, that's track for you, but at this point you can be sure that just about everyone in the running world knows him and come World Champs will definitely be paying attention. Profile Of UK's Jessica Ennis And Her Coach, Who Has Been With Her For 14 Years Since She Was 11 Article likens Coach Toni Minichiello to actor Al Pacino. UK's Christine Ohuruogu: "Once The Face Of The Games, Now Yesterday's Woman"
French Athletes Trained To Fight With Their Heads? The Monaco 1,500 incident was "eerily reminiscent" of when French midfielder Zinedine Zidane head butted Italy's Marco Materazzi at the World Cup final. David Monti Takes A Look At Morgan Uceny's Rise To The Top Of The 1,500 Ranks The daughter of a bricklayer and bus driver knows a thing or two about hard work. She gives a lot of credit to her training partner Anna Pierce for her rise, as well as her coach. Ryan Hall Sees BOA Chicago Marathon To Olympic Trials 14-Week Gap As Ideal Hall also sounds like he's tired of being the rabbit: "In Boston I functioned as the pacemaker." Rojo Gets Props In A Brief Chat With Sage Canaday What other college coach would let his athlete run a marathon in college and run the Trials the week before he qualified for NCAAs in cross? Canaday has now gone on to 2:16:52 and to write a book Running With The Hansons. Good Idea: 700+ European Jrs. Go To Anti-Doping Program Where A Lottery Was Held To Send Them To European Champs Last Year People need to be taught at an early age that winning at all costs is not what sports is about. Winning fairly is. Koreans Start 30-Day Countdown To Worlds The article claims that at the last World Championships, there were 8 billion television viewers. We don't believe it. There are only 6.75 billion people on the earth. 132 Food Inspectors To Be On Hand In Daegu To Make Sure Food Isn't Tainted Apparently food poisoning is common in the summer in parts of Asia. Last week, a Chinese court sentenced people for selling pork tainted with a poisonous chemical. Ryan Hall To Run Chicago Philip Hersh of the Chicago Tribune has broken the news that Hall will run this year's Bank of America Chicago Marathon and take on Boston runner-up Moses Mosop. Three months later, Ryan will run the Olympic Marathon Trials. The appearance fee of Ryan is so high that the Chicago/Trials double makes a lot of cents sense. Ethiopia Releases Provisional Daegu Worlds Team Rupp's medal chances seem to be going up by the minute, as this article makes it sound like Bekele is still struggling. 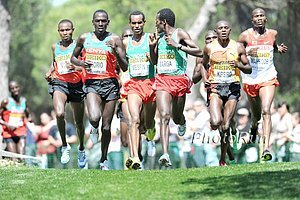 5,000m - Men: Dejen Gebremeskel, Tariku Bekele, Abera Kuma, Yenew Alamirew. Women: Meseret Defar, Sentayehu Ejigu, Genzebe Dibaba. 10,000m - Men: Imane Merga, Sileshi Sihine, Ibrahim Jeilan (and Kenenisa Bekele, if he's ready). Women: Meselech Melkamu, Belaynesh Oljira, Tigist Kiros. Russia's World Championships Team Is Announced Two marathoners with the same name, Aleksey Sokolov, will race. Bryan Clay & Sanya Richards-Ross But Not Galen Rupp To Be Helped By BMW's Tech Gadgets BMW will help 10 athletes that are part of its BMW's Performance Team by using "the stereo-vision technology that the company tests in its automobile safety systems" on athletes. Recommended Read US 100m Hurdles Champ Kellie Wells Is Not Afraid To Admit She Was Sexually Abused As A Child - Wants To Help Others Sexually abused for a long time before being raped as a 16-year-old by her stepfather, Wells is adamant about not hiding her past, as too many people sweep similar stories under the rug and the abuse conditions. She's hopes her track success allows her to form a foundation to help abused families. "People don't listen to the girl in fifth or sixth place who is not making teams. They listen to the person who is successful, and if I'm successful it means I can share my story with girls and boys and women who will look up to me. Your past doesn't have to dictate your future, and that's an important thing I want to stress to people. Just because something bad happened to you, that doesn't mean that is who you are." Lukas V Talks About His Dream Date & Much, Much More "Anything would be perfect with the girl of my dreams but if I had to choose I would make her a really nice dinner, then we would go out to a concert (either John Mayer or Dave Matthews Band) that's at a beautiful park where afterwards we would walk around in the dark holding hands while eating ice cream. Once we have nothing more to say to each other we would just gaze at the stars and end up kissing. We would have to be in the moment to know where things go on from there ..."
Meet The Mother & Daughter Sprint Combo Of Irina And Olga Lenskiy Both are at the top of their events in Israel at the same time. Mom at age 40, though, was able to beat her daughter at her specialty of 100m by the slimmest of margins - .01. Geoffrey Mutai Wins In Castelbuono He ran 29:05 to finish over a minute ahead of NYC Marathon champ Gebre Gebremariam in 2nd (30:13) and Mathew Kisorio 3rd (30:14). London Marathon champ Emmanuel Mutai finished sixth in 30:48 and Ryan Hall was supposed to race this, but his blog says he's currently in Switzerland. Upcoming: Gebre Gebremariam Returning To Defend Title At Beach To Beacon 10k Sam Chelanga will also be in the field. US marathon record holder Deena Kastor and twice Olympic silver medallist Catherine Ndereba in women's field. World Champs News: Nickson Chepseba Looking To Prove The Team Selectors Wrong After Being Dropped From The Kenyan World Champs Squad Apparently Chepseba only learned he was replaced on the WC 1,500 team by Daniel Komen when he read the news in the media. Article also mentions Chepseba's unusual transition to the 1,500, as he was originally a volleyball player, then a 10k runner, and then moved down to the 15. *HEPS XC Champs Moved From VCP To Princeton Due to the ongoing construction, Heps will be held at somewhere other than Van Cortlandt Park for just the 3rd time in the 72-year history of the meet. *NCAA Now Requiring Schools To Monitor Social Media There is a company that will "flag" all rostered athletes' names so that the athletic department can follow them and be notified about what they say. Entry Lists The men's 800 is stacked with David Rudisha, Nick Symmonds, Boaz Lalang and Abubaker Kaki. The men's 3k should be interesting with Mo Farah, Aussies Craig Mottram & Ben St. Lawrence, and Ireland's Alistair Cragg. The women's 5k has a deep field of US women with Jen Rhines, Desiree Davila, Amy Hastings and Lauren Fleshman. Men's 5k is weaker but has US runners Ben True and Brandon Bethke along with OTC/UK's Chris Thompson. Women's 800: Kenia Sinclair, Jenny Meadows and Molly Beckwith. Men's steeple has Ben Bruce and Bill Nelson, as the women's is led by Milcah Chemos and has NCAA/US champ Emma Coburn. In the sprints, Jamaica stacked the 100 with Asafa Powell, Nesta Carter and Yohan Blake. Walter Dix leads 200m field. Kara Goucher Pulls Out Of London Diamond League 5k With Hip Injury She said: "No London. Heading back to Portland to be with my therapists. Still hoping for World Championships." UK Athletics Sticking To Their Ban On Dwain Chambers As They Won't Let Him Compete In The London DL However, they ironically asked him to do a filmed TV interview representing UKA. Bernard Lagat Talks About Retirement He says that if he can win gold in 2012, he'll be happy to say that's his last Olympics and maybe have one more "farewell" season after that before ending his career. Interview With Marty Liquori, Who Says He Isn't That Impressed With His Sub-4 HS Mile "There are dozens of African kids who have run that fast by the time they were 18 years old, so it isn't really that big of a deal worldwide. What I did in high school is just that - what I did in high school." USOC Chief Admits He's Worried US Might Not Finish In Top 2 In Medal Counts At 2012 Olympics We aren't buying it and think he's just a) setting expectations low and/or b) angling for government funding as many of the other countries rely on heavily govt. funding. Ahletics Ireland Quickly Moves To Dipsel Rumor That "B" Atheltes Will Get To Go Olympics Only those with the "A" standard will be allowed to go. Ricky Simms Says Usain Bolt Is Easy To Work With And Possibly "Worth Double What He Hets Paid"
Bix: Silas Kipruto, Caroline Rotich Win $12,500 At Quad Cities Bix 7, Abdi 6th This is one of America's premier road races. Hungary GP: Asafa Powell Wins In 9.86 In Windy/Cold Conditions With the consistent times he's putting up, it's almost hard to call Bolt the favorite going into Worlds. Oscar Pistorius was last in the 400 in 47.47. 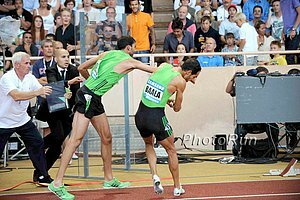 France Champs: Christophe Lemaitre Runs Wind Aided 20.08 To Win 200 Shattered NR of 20.16, but not wind-legal. Japan's Yuki Kawauchi Tunes Up For WCs By Winning Kushiro Shitsugen 30K Road Race He ran 1:33:55 (5:02/mile pace). Steve Mullings Wins 100 In 9.93 In Italy He also went on to win the 200 in 20.22. *After All That Talk About A "Strict 'A' Standard Policy," Ireland Is Considering Letting "B" Athletes Go To London Most countries do bring one athlete per event with the "B" standard, so no reason why they shouldn't. *GB Comes Down Harder Than Anyone On Dopers, But Now Make A Hypocritical Move They are "forcing" discus thrower Lawrence Okoye to work under Olympic drugs cheat Vesteinn Hafsteinsson. *Nick Willis' Medal Chances At World Champs Are Looking Good He's always been good in a tactical race and he's comfortable in a fast one, too. Race Director Re-Organizes His Entire 25k/50k Trail Race In One Day When Unexpectedly Loses Venue John Storkamp: "I never considered canceling the event. Trail running and ultrarunning is not for quitters. We would have had it on a track, in a parking lot, or in my backyard if we had no other choice." 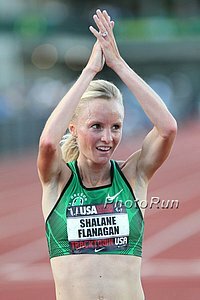 LRC Vivian Cheruiyot Sizzles, Shalane Flanagan Misses, Kenia Sinclair Stays Undefeated*, LaShawn Merritt Returns, Usain Bolt's 20.03 Win Leaves Some Questions, Silas K Wins Again And Much More Stockholm was the second-to-last Diamond League meet before Worlds and last for many athletes competing. Vivian Cheruiyot and Silas Kiplagat stamped their status as favorites at Worlds. Usain Bolt won by nearly half a second and we weren't that impressed. David Oliver was upset, Yelena Isinbayeva came back to form, and an Aussie became the favorites for Worlds in the long jump. The American distance runners disappointed, except for 37-year-old Magdalena Lewy Boulet, who ran a huge 50-second PR of 15:14.25 in the 5,000m. *Bolt Complains Of Back Pains On Tight Turn In Stockholm Caster Semenya runs 2:01 and says she is disappointed and worried, as she should be. 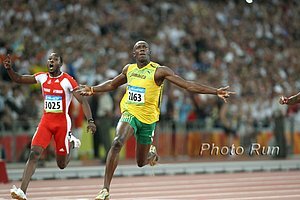 *Scientists Say Usain Bolt's Key To Success Lies Not With Foot Speed, But Foot Pressure Lets him take 41 steps in a 100m while the normal elite takes about 44. *Yelena Isinbayeva Backs Up Her Bold Statements With A Win In Stockholm She said before the meet she was "still the best vaulter in the world" and she proved that by beating high class DL field. Kenya's Men's 800m Squad Is The Only "Surviving Trio" From The Kenyan Team That Competed At Berlin In 2009 Their coach stresses that they will practice using teamwork tactics to make sure all three of them make the final. Q&A With Allyson Felix Talking About Her Decision To Do The 200/400 Double Reveals that as of now she will do both relays, but only the finals, she will not run any of the rounds. *USATF Profile On Texas Wide Receiver And US Long Jump Champ Marquise Goodwin He talks about the balance needed to split his focus between football and track and he isn't sure in which one his future lies. *Khalid Mulazim Breaks Master's World Record In The 400m With 50.18 He says the record will last about a month as he plans on going sub-50. Athletics Kenya Now Is Letting World Championships Team Members Race In Europe AK Head: "We have noticed that our athletes have become more professional in how they are competing and are using these races to maintain their form. This is very good for our country and that is why we allowed them to enter these events." Mo Farah's Moving Up To The Marathon ... after 2012, he says. "I think 2012 will probably be my last track season, Ill probably move up to the marathon from 2013 onwards." Czech Republic's Decathlon WR Holder Roman Sebrle Will Compete At French Champs, Which Start Thursday The 36-year-old needs 8,000 points to qualify for WCs. We say - let him compete regardless. We 100% Agree: Michael Stow, the head of science and medicine at UK Anti-Doping, said he does not believe that substances such as cocaine and ecstasy should be treated in the same way as performance-enhancing drugs. Battling Injury Problems, Irish 400m Record Holder (44.77) David Gillick Calls It A Season - Sacks Tyson Gay's Coach Interesting to note that Tyson Gay isn't the only Lance Brauman-coached athlete struggling with injuries. He's going back to his old Irish coach. LRC Week That Was: American Men's Medal Chances In Daegu With less than a month until Worlds, in our weekly look at the world of track and field we look at the American men's distance medal chances in Daegu. And while our beloved Menjo won't be in Daegu, he is in the news. Plus we've got some football talk from Florida coach Will Muschamp, a Brit celebrating July 4th, and Alberto on old school and new school training. Athletics Weekly Maps Out Allyson Felix's World Champs Race Schedule With relays, she could face up to 10 races in nine days. Professor Attributes Jamaica's Wealth Of Fast Sprinters To A Diet Of "Yam And Bananas"
Russian Vera Sokolova's 20K Racewalking WR Ratified By The IAAF In related news, Guinness World Records ratifies records for largest tonsils removed and most nails filed in 8 hours. UK "Rolling Out The Red Carpet" For IAAF President Lamine Diack In Lobbying Effort To Host 2017 World Champs Never underestimate the power of kissing up. Study Done On UK Olympians Reveals That You Have A Better Chance Of Winning An Olympic Medal Based On Your First Name Study concludes that your best chance of winning is if your name is John or Katherine because those are the names most common to UK Olympic medallists. This is probably true and it has nothing to do with the fact that those are popular British names. UK Coach Van Commenee Says "Nervous Athletes Are Just Not Prepared" And Are "Unprofessional"
*Are Van Commenee's Coaching Tactics Brilliant Or Bullying? "Elite athletes have the ability to focus on their own business, no matter what sort of noise of people are around - also, no matter what sort of relationship they have with their parents, their fiancée or their head coach. They are focused, in this case, on jumping far. The rest is not relevant." It's Official: Allyson Felix Doing The 200/400 Double At World Champs She is seeking to make history twice, as no one has ever won the 200/400 double world titles and she is seeking an unprecedented 4th straight title in the 200. Video Interview With Ryan Hall: Talks About His Training And Racing Since Boston Says he's enjoying the freedom of being self-coached, as he's on the Europe circuit with Sara and training-wise he's really learned to listen to his body rather than "be a slave to a schedule." Carl Lewis Was Part Of "Project 30" Report Group that was formed after a disappointing 2008 Olympics to assess the issues and problems in US track and field so that they could be corrected and help the US hit the goal of 30 medals in 2012. He said a big issue lies with the relays and that "we're talking about 30 medals and we still haven't figured out how to pass the baton." Coaches Try To Increase Interest In The Sport By Holding Pole Vault Competition On The Beach Rory Quiller won the men's elite class with 17.6 ft., while Jess Mira won for the women in 11.6 ft. The event was held in Lake George, NY. Steve Magness Talks About Getting His Dream Job Of Working With Alberto Salazar At Nike Not sure if Magness (who ran 4:01 in high school) still wants to break 4, but he is still running and pacing Kara Goucher and even Rupp and Farah in workouts.